Will Spam cause the fall of e-mail? I was looking at our Spam filter stats, and it is awe-inspiring at how much junk we get each day. I genuinely believe we can blame the Spam problem on the creators of telemarketing and direct mail as I see these invasive techniques are the grandparents of the modern day spammer. 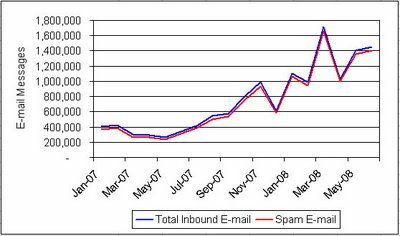 Will the increasing levels of Spam cause a decline in e-mail usage as people opt for other methods of communication that are less prone to Spam or will the evil spammers just invade any new medium that is developed? This is simple to answer, spammers follow the money. We have been seeing an increase in e-mail Spam and Spam via SMS and IM for the last few years now. Is a new industry being born right before our eyes? Spam filtering for SMS and IM much like what we have for e-mail or am I behind the times and it is already being done? The simple fact is spam works. Even the markets can be manipulated by spammers. Spam Works: Evidence from Stock Touts and Corresponding Market Activity. Spam will not go away until people stop clicking on links and buying products. Spammers follow the money…if people do not spend money the spammers will go away, however, this will never happen. People do illogical things all the time, and this is one annoyance we will have to live with forever. Filters get better all the time but so do the spammers. It is a game they play, and the stakes are big business. Companies cannot afford the loss of productivity or the potential lawsuits from offended employees when they view explicit Spam messages. In 2007, it was estimated by Nucleus Research Inc., that spam would cost $71 billion annually in lost employee productivity. Even the free e-mail providers, like MSN, Google and Yahoo, use spam filters to protect their networks and to entice subscribers to utilize their services. This concept is not lost on the traditional Internet Service Providers (ISP) as they offer consumers software bundles to help filter out junk e-mail. I do not get it! In the age of identity theft and online fraud, what they heck is any human, with more then two brain cells, doing by clicking on an advertisement they received via an unsolicited e-mail? People are just feeding the problem. By the way, if you are thinking about becoming a spammer…ah…I mean “utilize an online e-mail marketer to promote your product”, please read this recent article on CIO.com.